We applied a knockdown texture to the ceiling and walls in our master bedroom, and it turned out quite well. Here's how we did it. When it comes to DIYing, we've done a lot of different things, so it's really interesting when something totally brand new comes along that we've never tried. Recently that totally brand new thing was to apply a knockdown texture to the ceiling and walls in our master bedroom. Hubby had scraped off the yucky, nothing-says-the-80s-like-a-popcorn-ceiling texture from the vaulted ceiling. 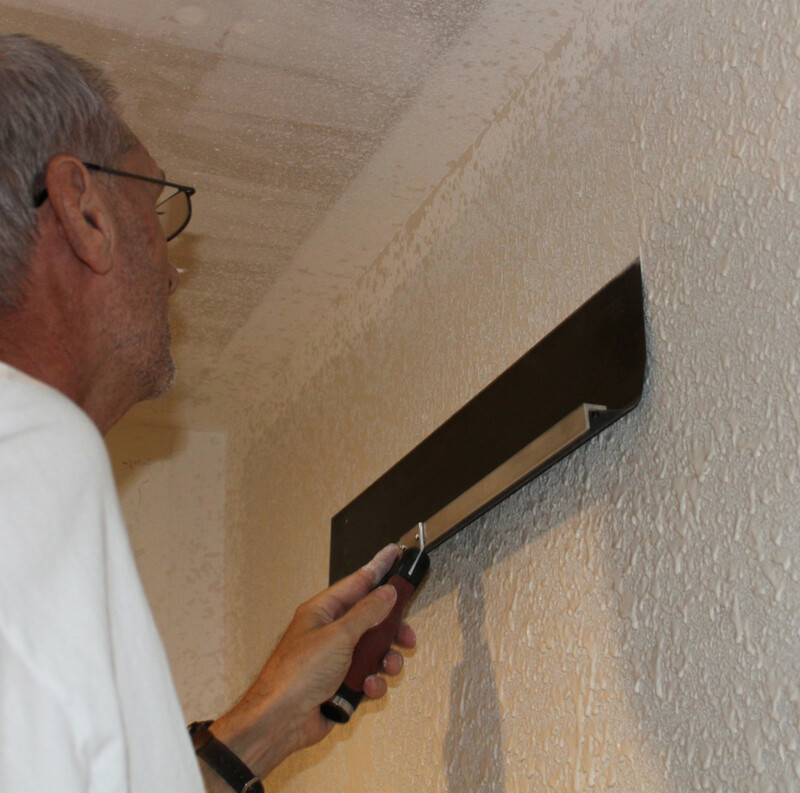 He had also realigned some walls in the hallway and closet, so there was new drywall which needed to be textured to match the rest of the room. I have to admit that when it comes to doing new things, I'm a timid DIYer, while my husband is a full-steam-ahead kinda guy. The idea of spattering gooey wall texture wildly about our bedroom was pretty intimidating to me, but now that it's done, I can say that it's really not that hard, and is a project any DIYer can tackle. The first thing is to make sure that you have the proper tools available. We had to purchase a few new items and it warmed the cockles of my husband's heart to have some new tools to play with. 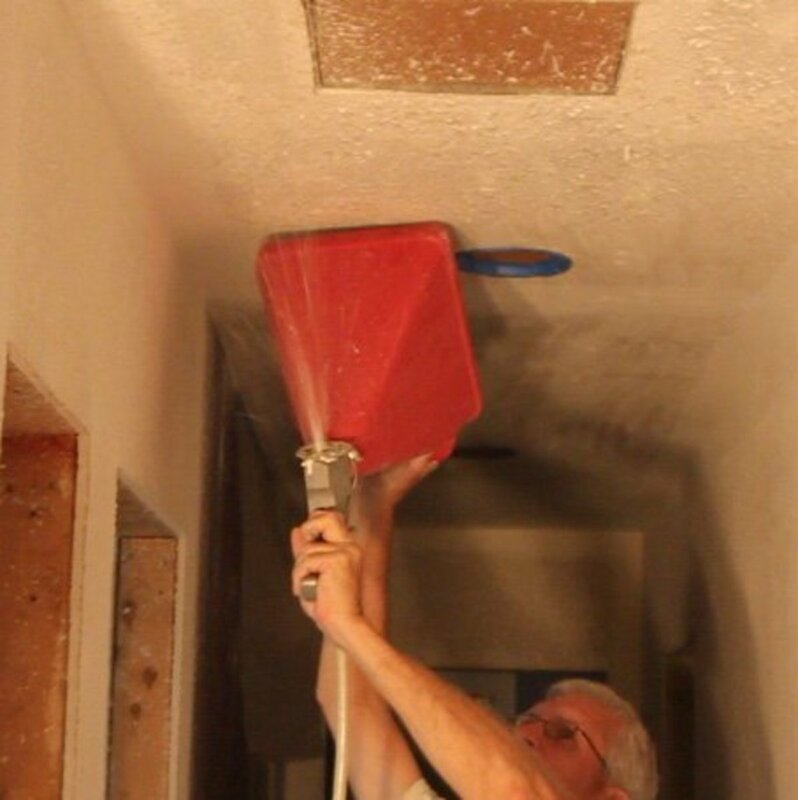 The first thing you'll need is a drywall hopper gun - it looks like a giant funnel attached to the top of a metal sprayer, and that's pretty much what it is. You attach it to an air compressor, pour the mixed wall texture into the hopper and then squeeze the trigger to release the spray. There are TONS of hopper guns to choose from, so look for the features that best fit your needs. We chose the Stanley G13301 Pattern Pistol Gun and Hopperbecause it would spray a knock down pattern, hubby liked the capacity of the hopper and he also liked that it had a 45 degree attachment to help angle the sprayer when you're doing ceilings. Check for good reviews and read the user comments to help you make your decision. Of course, you'll need an air compressor. If you don't already have one, you'll need to buy or rent one. 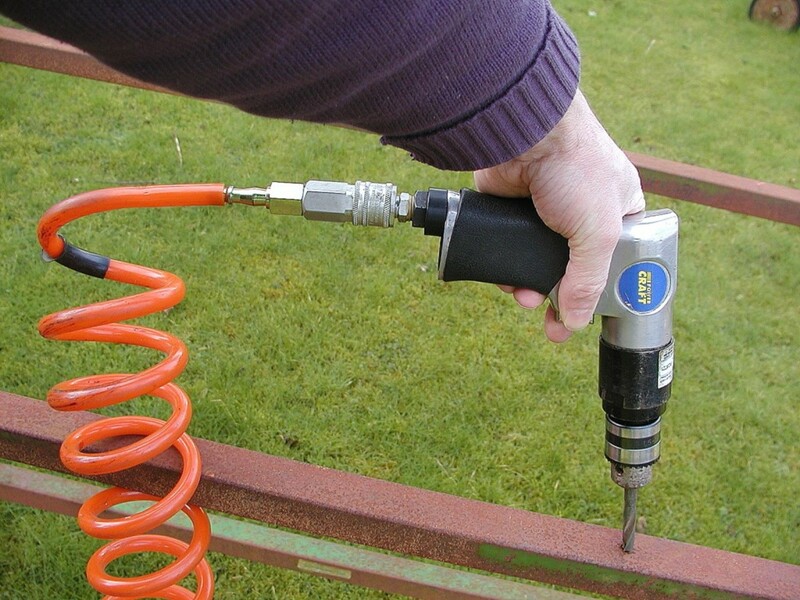 Just make sure that the hopper gun you choose is compatible with the size air compressor you'll be using. You'll need a knockdown blade to smooth down the texture once it's set up. Because of the large surfaces that we were texturing, we purchased a Marshalltown KD24CD 24-Inch Curved Blade Knockdown Knife with DuraSoft Handle - that's a mouthful! 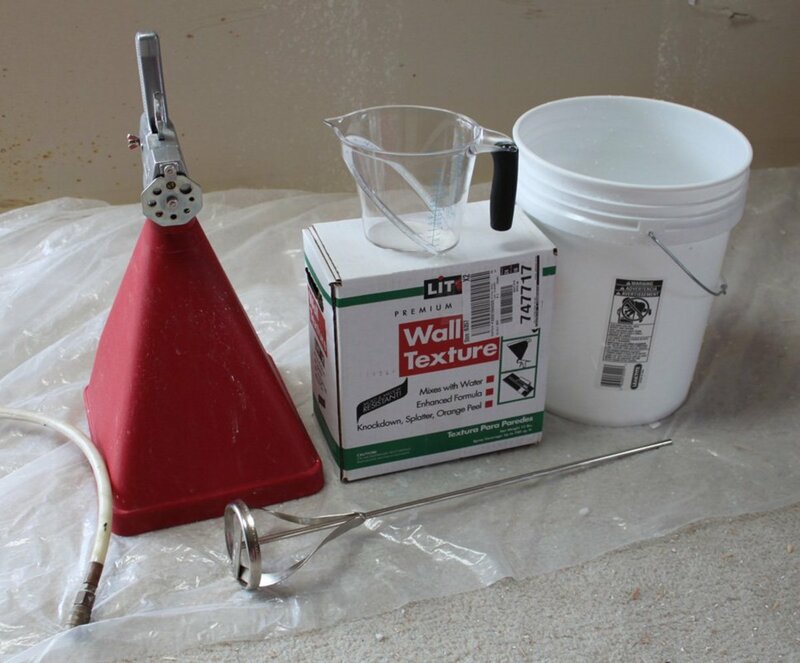 We picked a mixer drill attachment off the shelf at Home Depot, as well as a 5-gallon bucket to mix the texture in. We also grabbed a few 15-lb. boxes of the Wall Texture mix and then we were good to go. This is the part we're bad at because we're so anxious to get started with our project, but you've got to take the time to prepare the area you'll be spraying. 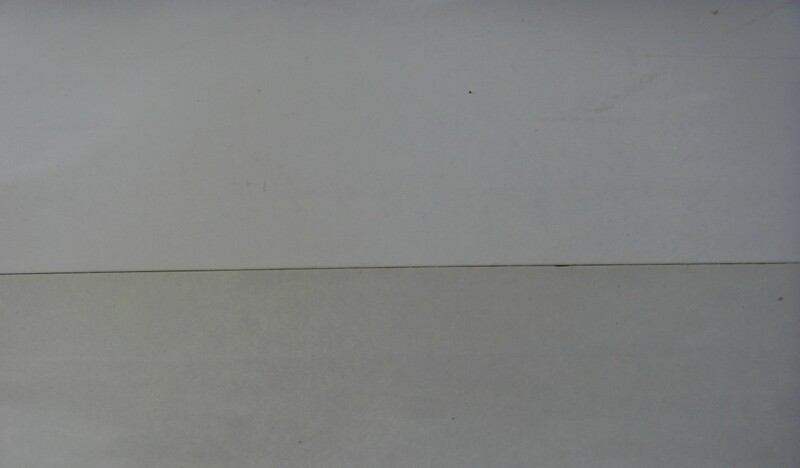 Make sure that you've patched any areas that need it, and that the surfaces are sanded smooth. New drywall should have properly taped and mudded seams which are sanded smooth as well. If you don't do this, you'll be able to see those areas even after you've textured, and you won't be happy with the results. Next, make sure you protect any areas that you don't want oversprayed—windows, floors, doors, outlets, and light switches. If you're spraying ceilings only, protect the walls with plastic sheeting. Take the time to do this, and you won't be dealing with the headache of cleaning up overspray later. 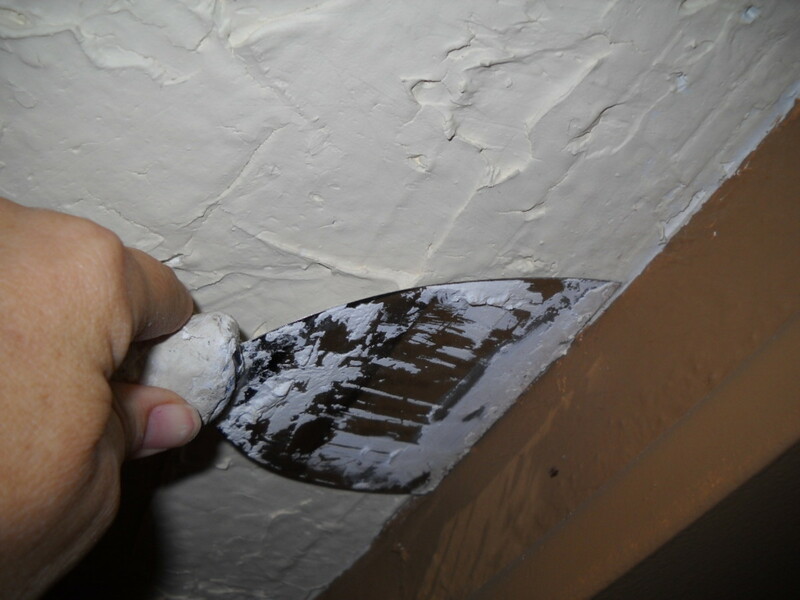 When you're ready to apply your texture, you'll need to mix up a batch of the wall texture compound. According to our mix, you should try for a consistency of thick pancake batter. I think the important thing to remember here is to add a little less water than recommended at first, and then gradually add more to get the desired consistency. You can always add a little more, but you can't take it out once you've added too much! Here's the technique we use on a 15 pound bag of wall texture and it works pretty well for us. 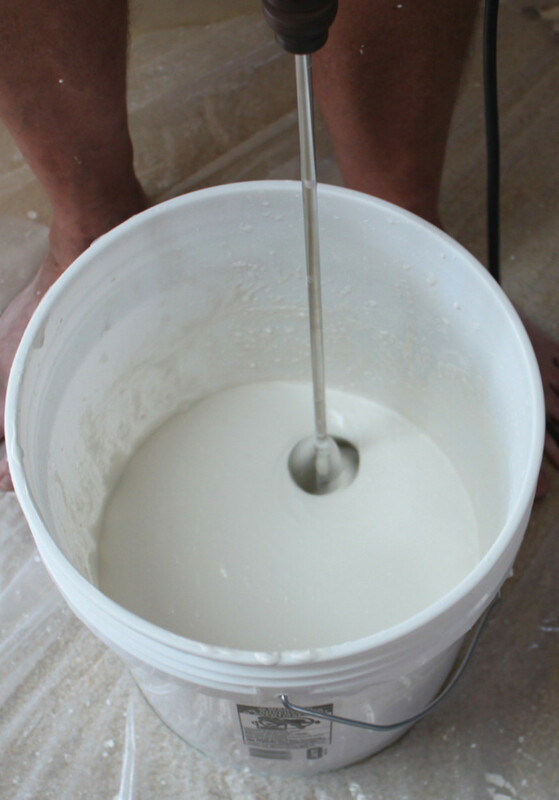 We first pour 2 quarts of water into the bucket, and then add a portion of the texture powder. After mixing until the powder and water are combined, we add 2 more quarts and another hefty helping of texture powder and mix it well again. Finally, we finish up with 1 more quart of water and the rest of the powder. We mix it well and let it sit for 15 minutes. After that, we stir it again and check the consistency. Usually it's fine, but sometimes we add a little more water at this point. Remember, you're going for pancake batter consistency. Once you've got a consistency you like, it's time to spray. When your practice texture makes you happy, you're ready to tackle your actual ceiling and/or walls. Hold the hopper gun about 2 feet away from your surface and squeeze the trigger, all the while keeping the gun moving. Check your texture coverage constantly. Too much spray in one area will make a large flat area when you knock it down, so if you notice a heavier-than-desired concentration, scrape it off right away and dump it back in the hopper or bucket. If you notice an area that doesn't have enough texture, simply spray back over it. After your texture is sprayed on, it needs to set up for about 15 to 30 minutes. It should be tacky but not dry. Drag the knock down blade lightly across the texture to flatten the tops of the globs of spray. Don't press down too hard—you don't want to actually remove the texture or smear it around. The goal is a nice, stucco-like finish. If the edge of the blade leaves any lines in the texture, make sure to go over them again to smooth them down. Continue until the entire area sprayed has been knocked down. Let it dry for at least 24 hours. 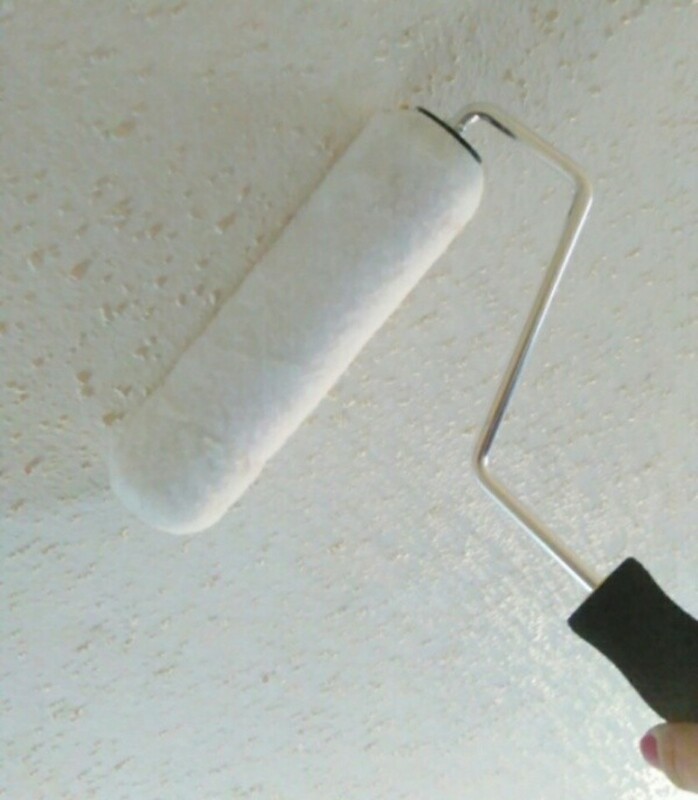 Then your textured drywall can be primed and painted in the color of your choice. Enjoy your newly finished drywall! A 24-inch knockdown blade works great if your surfaces are perfectly even. HOWEVER, if a surface cups or bows, wibbles or wobbles, the knock down blade will not touch some areas as you drag it across the texture. You may have to use a smaller blade for these surfaces. The 45-degree angle hopper gun attachment, which we thought would be so great for holding the gun at an angle to spray ceilings, turned out to be a real dud. When we used this attachment, more spray got on the side of the hopper than it did on the ceiling. After about a minute of this, my husband quickly took off the angle attachment, and simply put less texture in the hopper, and held the entire contraption at an angle to spray the ceiling. When you're spraying near a doorway opening, have someone block the opening with a large piece of cardboard. Otherwise, you'll be shooting texture where you don't want it. Could I apply a California knockdown to just a ceiling and not the walls in the same room? I'm not familiar with California knockdown, but I know that you can apply knockdown texture on a ceiling and not the walls. You'll have to cover the walls with something to protect from overspray. By far the most organized and clear description of having fun I've read. Hi, Patrick - I wish we were good record-keepers, but we're not :o) I have no idea what our cost per square foot is, but I can tell you the approximate cost of our items...the hopper gun was about $70, the knockdown blade was about $20, the mixer drill attachment was less than $15, and each box of texture is about $13. We already had the compressor. Hope this helps! 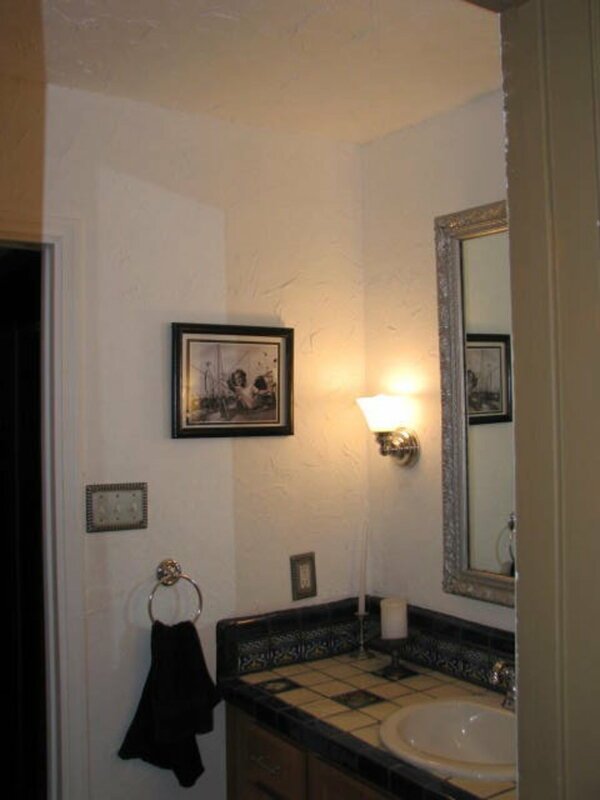 Do you have an approximate cost persquare foot for applying the texture with your project? Including materials and tools. Thanks! Great post! Thanks, Wilderness. 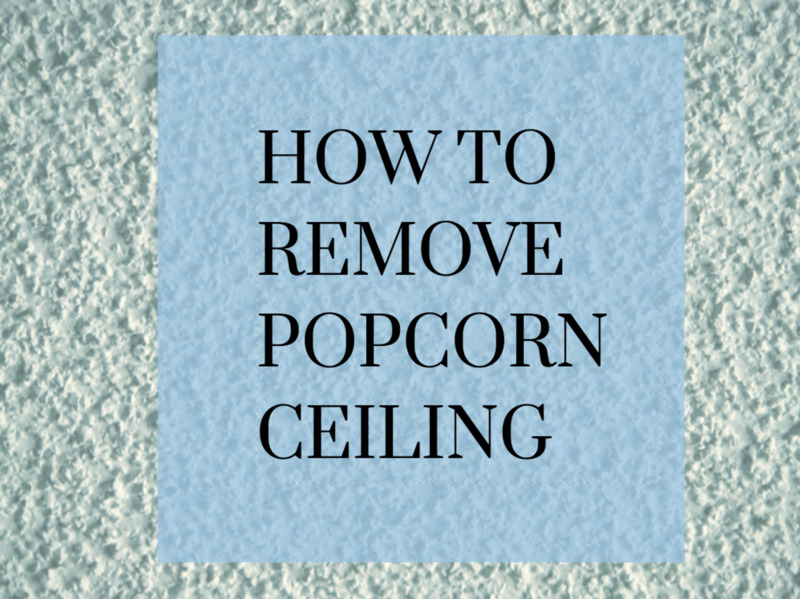 We're fortunate that this can be a DIY job...we've got popcorn texture throughout this house, and I would hate to think of what it would cost us to have the pros do it! Good advice here. I've never done my own texturing, but have worked with the pros many times while they did. Equipment has become cheap enough, and easy enough to find, that anyone can do it anymore. Good luck! We are starting on the ceiling in our 3rd room...hubby is getting to be a pro :o). Hope it goes well for you! Thanks for the tips. We are fixin' to start on a living room ceiling that looks horrible and needed some sound advise. Looks like we are gonna have some fun. Thanks again and God bless.